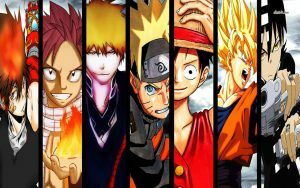 The Voice of All Things One Piece – Can someone hear the Poneglyphs? Hello everyone, it’s been a while since our last post and i think we are ready to move on with more interesting theories. Today’s post is about the Voice of All Things One Piece, and i’m really excited to share some interesting ideas regarding this and the four red poneglyphs. How are they all connected? Read on and you ‘ll find out. What is the Voice of All Things? It is a quite mysterious concept, as we don’t really know a lot about it up to this point, so that makes it a good one for us to theorise about. We first learned about the voice of all things from the Dark King Silvers Rayleigh. He stated that the Pirate King himself Gol D Roger was able to hear it. So what could that be really? I believe that the voice of all things could give someone the ability to “hear” the poneglyphs and thus deciphering them. That way Roger learned about the Void Century and the true history of One Piece. That way also he was able to reach Raftel quite probably. The Poneglyphs are mysterious blocks of stone that are supposed to have history written on them in an unknown ancient language. In the anime we have seen three different kinds of poneglyphs. We have the historical, instructional and road poneglyphs. The historical poneglyphs talk about the ancient history and also have messages of the ancient people. The instructional poneglyphs give away well, instructions 😛 about the location of other poneglyphs and the ancient weapons as well. Those two Poneglyphs have a deep blue color. We also have a third type of Poneglyphs, that differ from the others. Their colour is red and they are called Road Poneglyphs. There are only four of them in the whole world of One Piece and all together they point to a very important road. The one that leads to Raftel. 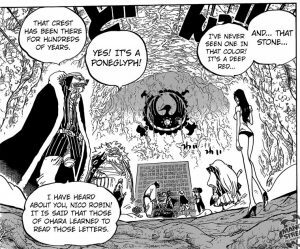 According to Nico Robin, the Rio Poneglyph is the real message that all the Poneglyphs along the Grand Line want to deliver. It is literally translated as the true text of history. In order to find the Rio Poneglyph, someone must follow the passage of all the other Poneglyphs along the Grand Line. 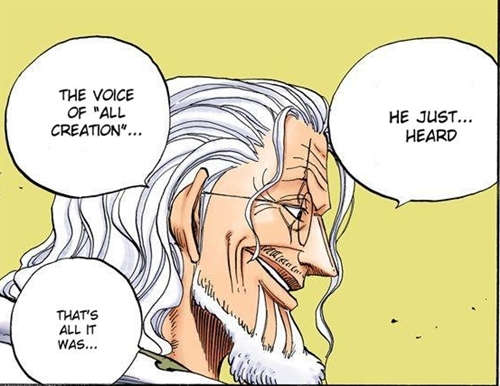 That feat was accomplished by Gol D Roger, with him witnessing the true history of the One Piece world and what really happened in the Void Century. He also left some messages along the way, written in the ancient language, in order to encourage others as well to follow the path. There are currenlty four red poneglyphs in the One Piece world, that when all deciphered are supposed to lead to Raftel. Big Mom and Kaidou currently have one each, one of them is in Zou and the other one is missing, but a good speculation can be that it is in Elbaf. When they where created they were given to the allied nations of Elbaf, Wano, Zou and some other unkown place. The Poneglyphs are indestructible and could only be deciphered from the Ohara researchers and the family that follows. A family from Zou that were the ones who created the Poneglyphs to start with 800 years ago. Thus, they were able to decipher them and understand their meaning, a knowledge they passed down to their descendants up to Oden Kozuki. Oden Kozuki is the father of Momonosuke and a member of the Kozuki clan. He was also a member of the Roger Pirates. Thus, he has reached Raftel along with the Pirate King himself, and has learned the secrets of the Poneglyphs and the Void Century. For some unknown reason(he probably didn’t want to let the secrets he knew out) he was killed by the Wano shogun and Kaidou with his Beast Pirates. That way though, he let his family and his son Momonosuke escape. I believe that Momonosuke possesses the ability to hear the voice of all things, much like Roger himself. 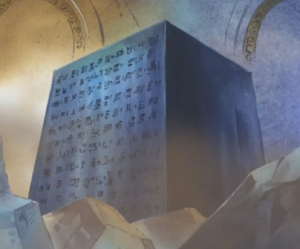 That’s why in the Zou arc, he hears a voice get louder in his head when he gets closer to the Poneglyph. As to why that makes him sick, i think it may have to do with what he hears from the Poneglyph. Could it be that he hears a sad story? That of the Void Century or that of the Wano Kingdom? After all, the redness of the poneglyph could easily associate with the color of blood and a sad story therefore. Who else can hear the Voice of All Things in One Piece? So up until now we know that the Pirate King Gol D Roger could hear the voice of all things and we have also speculated that Momonosuke may also be able to do that. Could it be that there is someone else who can do that also, or will be able to do it in the future? Yes, and i believe that person to be Monkey D Luffy. We have seen him somehow communicate with the Sea Kings in Fishman Island and i believe that may have something to do with the ability to hear the voice of all things as well. He has the potential and i think he will be able to do that in the future of the series. I think that the true nature of the voice of all things lies in its connection with haki. I believe that it is a manifestation of the ultimate mastery of haki, and in particular king’s haki. Gol D Roger had mastered the ultimate form of haki, and Luffy will probably be the one to do that in the future, before becoming the next Pirate King. To sum up, that were our ideas today regarding the Voice of All Things One Piece, as well as the Poneglyphs and their connection with it. What do you think about it? Share in the comments below. p.s. if you like our theories check our recommendations page for our top picks regarding One Piece, like our facebook page to the right or browse amazon recommendations right below this article :). All in all I really liked the post, and I am glad I ran across it because it is something I can add to my ‘dictionary’ of knowledge! Hello and sorry for creeping you out bro :P. Glad you liked the post! 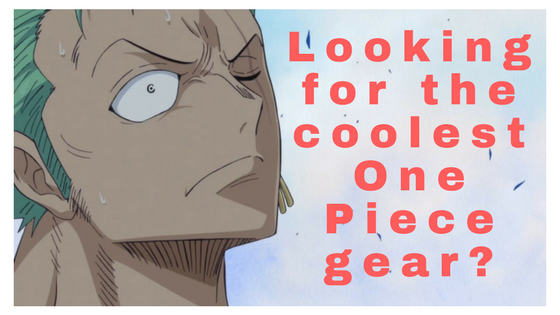 For staying updated, give a like to our facebook page(there is a banner in the sidebar) and if you are hungry for more be sure to check out our Recommendations Page with our top picks of stuff we like related to One Piece :). Next Next post: How to make money with g2a – What is the Goldmine feature?